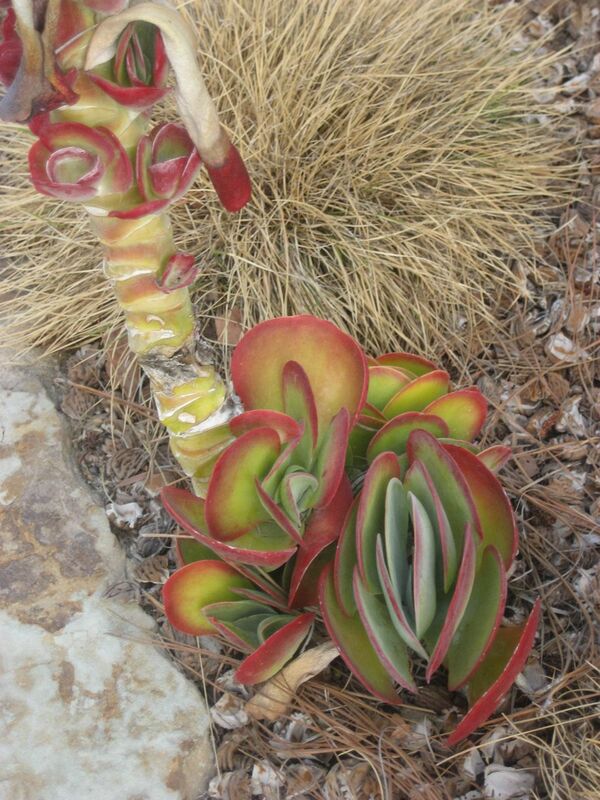 The succulent, Kalanchoe luciae “Flapjack” is one of the most dramatic looking plants I have in my garden. Jade green leaves with dark red wine margins. A 5″-inch pot may set you back $8 to $10 dollars or more, depending on where you live. Fortunately, Kalanchoe’s are a part of “natures stimulus” plan and are easily multiplied into many plants through “offset propagation. A “monocarpic” plant, once the Kalanchoe flowers, it starts to die, new “baby plants” can already be seen at the base. As a tradeoff for being monocarpic, the Kalanchoe is truly sympathetic and endows the gardener with “baby plants” and “offsets” to take it’s placed once it dies. I know lots of people who just throw the Kalanchoe away when it finishes flowering. Do you realize there are dozens of new plants waiting to be given a chance to live (and save you some money) through propagation? The best part about succulents is that they are so easy to maintain and can be planted in moss in a variety of materials including fancy looking pond fronds and succulent pillows that I design! First, I cut the flower stalk from the base of the new baby plant. I see lots of small Kalanchoe leaf clusters growing along the length of the flower stalk. The leaf clusters are the “offsets” I will use to make more plants from! 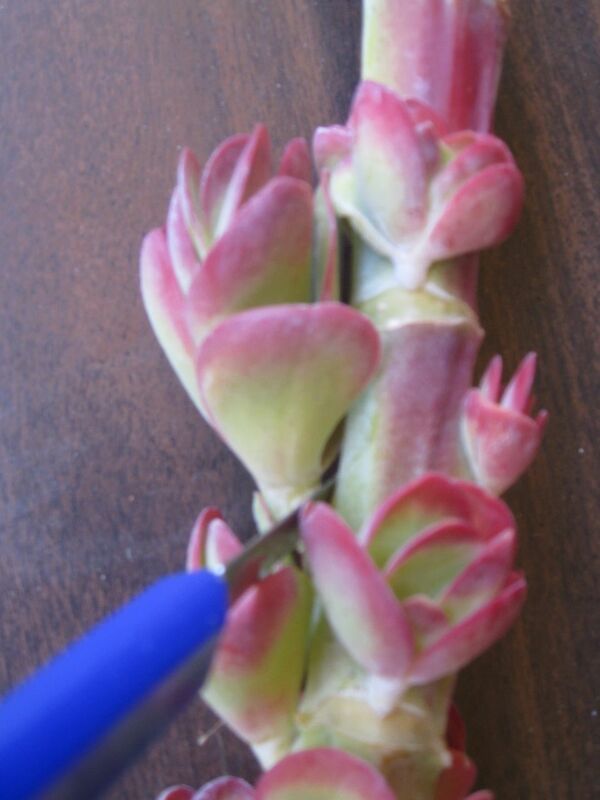 I use a clean, sterile knife to cut the leaf clusters from the stalk. I cut close to the base, snipping off a tiny part of the flower stalk. Next, comes the difficult part. I have to wait about 3 days for the ends to dry and callous before planting them! Succulents like Kalanchoe should be planted in a well-draining container, at least 5″ inches deep. A sandy rooting mix is best- you can buy it or use 3 parts sand to 1 part loam. Moisten the soil, but don’t saturate it with water. Keep your plants in a warm area, shaded from the sun. Water consistently, but moderately and you should have new plants in about 8 to 10 weeks! 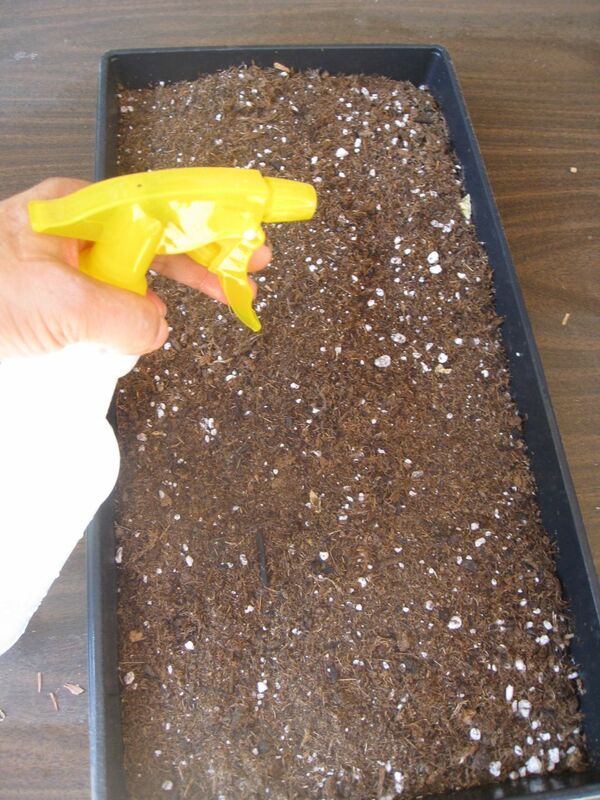 You can check to see if your plants are ready for transplanting by giving them a light tug. If you feel a slight resistance, roots have formed. Congratulations..you have a new plant! Multiply a Geranium Plant and More! Now that you’ve mastered multiplying Kalanchoe plants, try your hand at propagating geraniums…it’s even easier! Watch my Youtube playlist, “How to Multiply Plants” and start creating more plants for free! Please subscribe to my Youtube channel, “EdenMakers” and share the videos with your friends. Subscribe to Eden Makers Blog to receive updates for new, fun and exciting posts about gardening, houseplant care, garden design, makeovers, and more. If the plant has roots, I still wait 1 day before planting. Also the babies I cut seem to have their own roots, can I just plant or should I allow time to dry? So after I take the babies off the main plant, should I cut the bottom of the main plant to shorten it? Thanks for your question. As your kalanchoe ages, the original plant will wither and a new plantlet or pup will sprout from the base. Is this what is hapening? My Kalanchoe luciae is inside because of the cold temperatures. The tips of the individual leaves are drying and some of the leaves have completely dried and fallen off. Please give me any suggestions. The leaves are also very red and the plant is about 8 feet from the window. Thanks for your question. Is your kalanchoe getting bright light indoors? Is it near an air conditiong vent? Kalanchoe needs bright but indirect light indoors. Don’t put it next to a window if the sun is too strong. It can burn the leaves. Intermittent drafts are not good either. Continue to water when the soil feels a bit dry. Can you dig around the root area and include it in your transplanting? That would be ideal. Mine is in a pot, indoors during our HOT Utah summers, it has been curling and yellowing on the ends of the leaves, what am I doing wrong, and can I rememdy the situation? Thanks for your video. I have an aged kalanchoe plant with numerous small offshoots at the base. I recently decided to cut the small offshoot plants from the base and have a go at propagating new ones. Some of these small plants have roots attached. Should I cut off the roots as well? 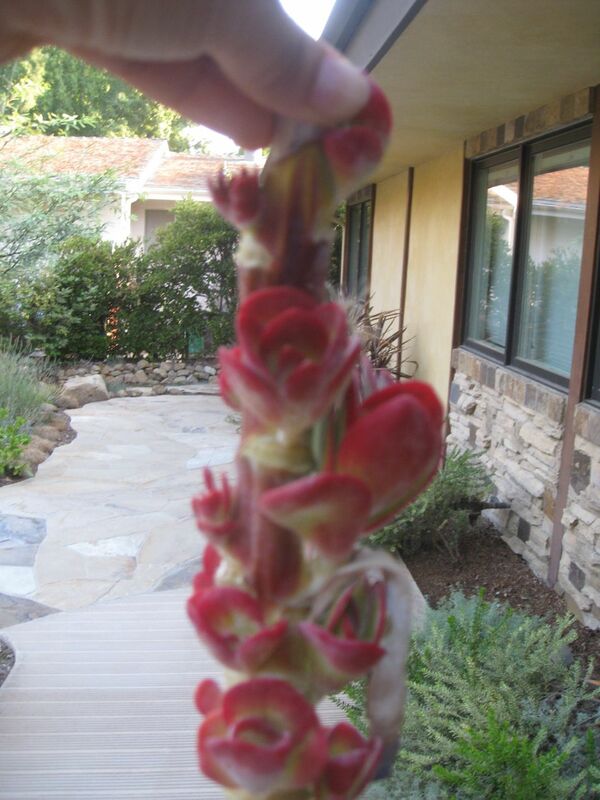 The Kalanchoe can go a long time before flowering and this is a good thing. Kalanchoe begins to die when the flower appears, but will be replaced by a daughter plant, so don’t despair. The chalky substance can be mildew and sometimes occurs when you don’t have good air circulation or the plant is not allowed to dry in between watering. Watering should taper during the cold months. IF you like, you can upload a photo for me to take a look. I have had mine for a year now but no flowers. That’s ok tho I’m sure it just needs more time maybe? Anyways, something I have noticed is strange and that’s why I’m here…. As I said I’ve had mine for about a year, and it’s in a pot. I live in Atlanta GA so it spends the warmer onths outside and the cooler ones inside. I have lost some of the lower leaves but it still looks very nice with a long stalk and leaf clusters at midway to the top. What’s odd is that in this past couple of weeks I have noticed a white chalk-like substance on the surface of my plant. It is all over top and underside of all leaves and the stalk. Is this a natural occurance? It cleans off easily enough, but I don’t want to remove it if it is necessary for the plant’s function. Any guidance would be appreciated, thank you! If I can figure out how to, I’d like to post a picture from my cell phone.My 6 foot flapjack is very dramatic looking. Hi I bought my first flapjack 7 months ago.now it us over 6 feet tall.I live in Florida and have it in a large pot.all my neighbors love passing and looking at it. Great information. I do have a couple of questions though. I have a flapjacks Kalanchoe I purchased about a year ago. Last Spring a leaflet broke off so I propagated it as well. Both plants are in 10″ pots and are growing like weeds. About a month ago, stalks starting shooting up (4 from the original plant and one from the offspring) and now have reached 6-1/2 feet in height. I live in Fullerton California (Zone 22 I believe). My questions are: If I allow the stalks to bloom will the plants completely die and need replacement or will new plants emerge from the roots? Also, what color are the flowers likely to be and when should I expect blooms to occur? Thanks. THANKS SO MUCH for this article! You not only helped me figure-out what this plant was (bought at a big-box chain store because I just liked it), but also helped me figure-out how to keep it going next season! I am trying to find out if these is a difference in the flapjacks that seem to curl and the flat ones? Thank you Angelina. Glad to offer some direction. Keep me posted on your “new” plants! Hello Shirley, My friend Val of the Ottawa Plantcycle drop this plant to my house today for division. As I do not know how to do it without killing the plant, I am so happy to find your plant. I blog about it, use your blog as a reference. Currently, there are about 10 little plants put to callous, so I can move them to propagation bed in 3 days. We are at -15C here in Ottawa City, ON, Canada, so tending to indoor plants cures the gardeners itch. Yes, the Kalanchoe does well in the tropics but should not be over watered. I havent seen one of these plants in personal before .. Does this grow in tropical places? There is such a thing as a low water plant and a plant that has no water!!! How often do you water your Flapjack? Is it in a container or in the ground? What is your weather like? Love my flapjack! But it is looking wilted! Droopy! What does it need? I’ve been told not to water it too much. Hi Dee! Thanks for taking the time to comment. You’ve got a gorgeous plant in your hands and now I hope you learned a little more about it. Make sure that your Kalanchoe gets at least 5 hours of sunlight. If the weather is especially hot, move it to a semi shade area until the heat passes. Don’t burn it! Thanks so much for this info! I love this plant and now know what to do with it! I bought one a few months ago at a local native nursery – it definitely caught my eye. I also learned mine is probably not getting enough sun, so I just ran out and moved it! Thanks again. Thanks for visiting Edenmakers and for your question. Kalanchoe’s are very easy care plants in the landscape. The only concern I have in Vegas is the extreme heat and cold. Succulents do well in warm weather but if they’ve been babied in pots they may need to acclimate to the extreme temperatures outside. Make sure your Kalanchoe get 5 to 6 hours of sun but not scorching sun. Maybe you can put it where it is a bit protected? 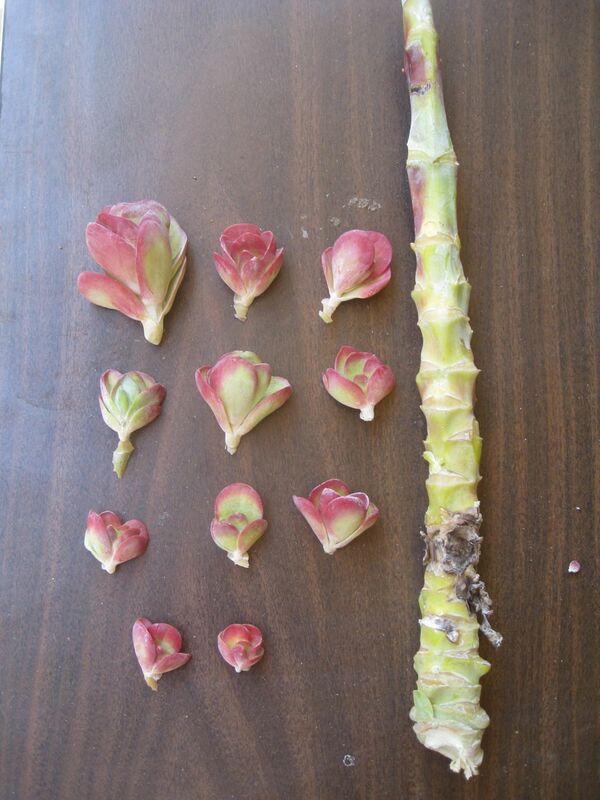 Cold temperatures under 45 degrees on a consistent basis may be too cold for this plant. I live in Las Vegas and have this plant in a pot. I would like to put it in the ground but unsure of the care it needs … sun/water/food? Will it survive the winter months or will I need to take it up? Okay Gil, go multiply a Kalanchoe plant! My pleasure Parisa. Thanks for commenting and good luck with your propagating. Thanks a lot, you’r instructions are really helpful. Hi Parisa- I would leave my succulent in the existing pot as long as there is still room for the roots. If roots are coming out of the pot or there is little soil left because it has been displaced by large root area, repot your plant in larger container. You may have a different variety of Kalanchoe than I do, there are many varieties that perform a little differently and have color variations. Hi, I’m really happy to visit your blog ( that was the first choice by google!! – and I think the best ). also the upper leaves of it are green and don’t have dark red wine margins and it loses it’s flower leaves (but your plants save most of them.. ). Is it normal? I have grown one of these in a pot and has flowered and many new babies underneath parent plant which is now starting to wither and die. Hi Rosemary. THanks for reading and commenting. Kalanchoe is a beautiful and dramatic plant for your garden or container. Enjoy showing it off! 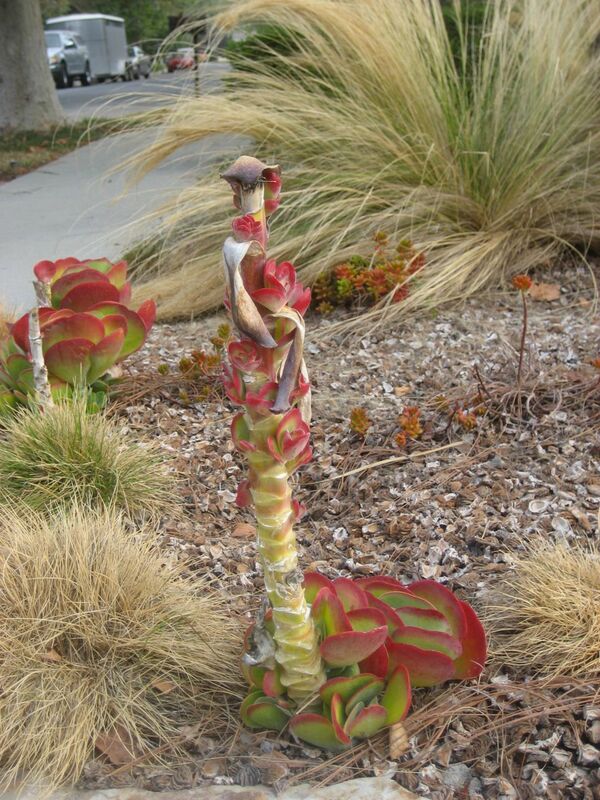 Hi Shirley, just found your website by googling flapjack succulent! I bought one a while ago, it was quite small and just grew until this big spike grew out of the middle! It’s an amazing plant, I’ve just bought a bigger pot to plant the small one’s at the base. I’ve stuck the bigger part in the ground just to see what happens. Thanks for your help. If you have a friend who has this plant, you can ask for a cutting. Otherwise, check your local, independent garden center. Those are awesome! I have a coworker who just started his cactus / succulent garden, and I’d love to get one for him. Where can I find a young one? Wow! I just love kalanchoe and the flap-jack is one that I’ve wanted for awhile. It seems like I’ve always got pups going on one plant or another. I would love to live in an area where my succulents could be planted outdoors like yours are. The giant size in your photgraphs takes them from fascinating to spectacular! Thanks for the post! thanks for the instructions and pictures. I didn’t know they had to dry and callous over first. I’ve seen such beautiful kalanchoes lately – that flapjack is great. Thanks Landscaper Guy! I have to agree with you. 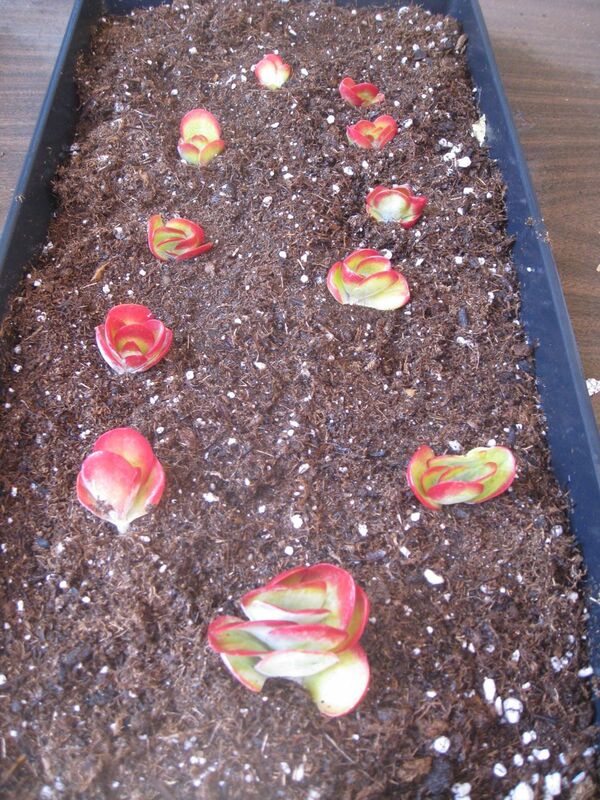 Propagating this plant is so easy! Excellent post! Kalanchoe’s are beautiful plants. There’s no excuse not to save money on these wonderful plants after reading this walk through. Thanks Shirley! I just visited your blog and enjoyed the photos of the beautiful plants in your garden. Come back and visit again. Great how-to post. I’ll follow your instructions for my Kalanchoe Flapjack. These plants ARE easy to grow, it’s just that it takes a little time for them to grow into a “sellable” size. Probably why they are not cheap! TIme is invested. For the home gardener though, Kalanchoes can be enjoyed immediately in a container. Glad I put a name to the “pretty face” for you! Have you grown any other succulent plant? I’m sure they are available in your area or by mail order. How cold does it get in your zone? I’m sure it could work as an indoor plant, just like you mentioned. Could you grow it as a container plant and move indoors during the cold season? They are beautiful? Just like art work in the garden! Their coloring is amazing, too! Wish I could grow some of that here. What a very pretty plant and I have no clue how it would do here in NC. I really like the red edges and uniqueness. I bet it would grow in my kitchen window and like you said–I can keep it little by snipping it’s arms and legs off. Thanks so much for posting this Shirley! I’ve grown, enjoyed and propagated this plant for several years but never could find out the name of it! Thanks to you, I finally have an answer! I love the look of this succulent and have found it to be a super easy to grow, problem free plant. But when I tell people it will die after it blooms, they get turned off and don’t want to buy it – even when I tell them they will a dozen more plants from the bloom stalks. Go figure! I have found it takes about a year for the offsets to grow to a “sellable” size. What is your experience?